Golden Globe-winning actress Tippi Hedren made a name for herself as the star of Alfred Hitchcock’s “The Birds” and “Marnie”, but it’s her role as an activist that has set her apart from, well, most celebrities. The actress devoted herself to raising her daughter, Melanie Griffith, and raising consciousness about the vital preservation of endangered animals all over the world – namely, big cats. She is president of the Roar Foundation, and resides on her sanctuary for animals in California called The Shambala Preserve. 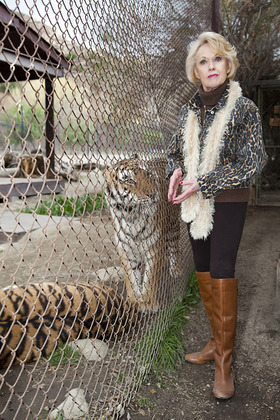 For years, this remarkable woman has tirelessly pleaded with Congress to pass legislation to stop the breeding and raising of exotic felines for personal possession or financial gain. It’s not just about preservation of exotic animals; it’s also about public safety. Her efforts have led to death threats, yet her passion remains steadfast. 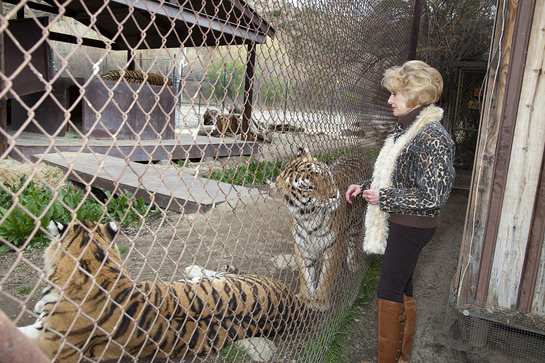 In 2009, she co-authored a bill titled ‘A Federal Ban on the Breeding of the Exotic Feline for Personal Possession’ and on September 20, 2012, she will again appear in front of Congress to plead passage of the bill, now titled: “Big Cats and Public Safety Protection Act,” aka as H.R. 4122. In her recent open letter to Congress, Hedren explains the importance of passing H.R. 4122, and with some public support we can all be part of this humane and necessary legislation. Look To The Stars was grateful to speak with Ms. Hedren about big cats, Congress, the fight to stop animal abuse and her aim to ultimately educate the public in regards to the inhumane treatment of circus animals and the need for this outdated form of entertainment to go away. What sparked your interest in big cats? The situation that caused the Shambala Preserve to come into effect was monumental. I’d always had puppies and kittens and bunnies and the normal type of pet, and I did two films in Africa in 1969 and 1970. One was in Rhodesia – which is now Zimbabwe – and the other in South Africa. In those days, environmentalists all over the world were telling us that if we didn’t stop the encroaching civilization on wild areas – the hunting, the poaching of wild animals – that by the year 2000 they would be gone. So there was a lot of awareness going on – we were learning about the plight of the whale, the panda, and the tiger. My husband was the producer, so we decided to do a film about this issue and were kicking around ideas – should we focus on one area, should we focus on one group of animals – and that answer came very quickly. We went on a photo shoot in Mozambique and came across a house that had been abandoned by a game warden on one of the preserves, and a pride of lions had moved in. There must have been 20-30 cats, sitting in windows, going in and out the doors, the cubs were playing out front. They looked like great portraits. I have the most beautiful picture in my mind of this fabulous place, and we thought “bingo”! Perfect movie set, animals which most people are either fascinated with or scared to death of. When we gave the script – and this is using sometimes ten cats in a scene, sometimes 12, sometimes 20 – to the trainers of these acting animals, everyone of them came back laughing at us and said this film cannot be done because of the number of animals working together. So eventually that led to the establishment of the Shambala Preserve. My first rescue was an 8-month-old lion cub who was purchased by a doctor in Los Angeles. He bought a cute little adorable lion cub, and as he grew he was tearing up the doctor’s house, taking chunks out of the doctor, plus he didn’t have any siblings for him to play with. So by the time he was about 8-months-old, he was screaming for someone to take this little monster off his hands. So I went and picked him up and brought him home to our place in Sherman Oaks, where he continued his demolition work. That was the beginning of these rescues. Were any of them movie animals? Yes some of them, not too many. We became a very, very important facility to the California Fish and Game Department, as well as other state fish and game departments when they would confiscate a big cat that was either treated really badly or living in squalor. And these stories were many – we had a lion living in the basement with a family who had children – I mean, this is one of the four most dangerous animals in the world and our government has always said yeah sure, breed them, sell them for whatever you can… and on top of that we’ll give you a permit. US Department of Agriculture- there is a whole lot wrong with that. And you are changing that? I certainly hope so. I’m working on my second Federal Bill. The first one in 2003 was to stop the interstate traffic of these animals to be sold as pets, and that was titled ‘The Cats of Wildlife Safety Act.’ I co-authored that and was asked to testify. What I did was I listed about 18 accidents – you know you have about 5 minutes to get your point across – and I just listed accidents, killings, maulling’s. There are hundreds and hundreds of people, adults and children that have been maimed and killed by these animals. Do people think because there’s not a law against it that it makes it okay? Well, how many people do you know, when they want to get a dog, look into what this dog is like – is it a lap dog, is a collie, do they do that? No, that’s why the shelters are so full of animals that people say ‘oh I didn’t know he was going to grow so big’, ‘I didn’t know he was going to eat so much’, etc. Tell us about the second Federal Bill? It was either ‘07 or ’09 and apparently the climate wasn’t right for this bill and it just sat there for a while. It’s the same bill – the first bill was the Federal Ban on the Exotic Breeding of Felines for Personal Possession or Financial Gain, now the bill is being cast as a public safety act, H.R. 4122, and hopefully that stops the breeding. The most important thing here is the public safety issue, to get it stopped because the government won’t act on an emotional basis -the inhumaneness of these animals being born in captivity – it is a public safety issue. 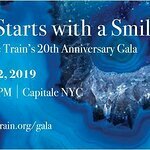 Which celebrities support your efforts? I have a whole list of them, but Betty White comes to mind first. 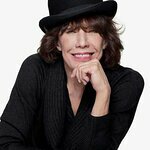 [Other celebrities include: Loni Anderson, Lily Tomlin, Kate Linder, Romi Dames and Lindsay Wagner]. Let’s talk about the circus? Who are we not reaching in terms of education regarding the epic inhumane treatment and abuse of circus animals? In terms of the circus, we are not reaching the parents who think that their children should see the circus with the animals in it. This is the propaganda we’re dealing with. The Ringling Brothers, they are about as big as the problem gets and they have the money to tell all these lies about how educational the circus is – to see the animals. Can you tell me what is educational about seeing an elephant sitting up, standing on its head doing a dance routine? There is nothing educational about that – parents need to be aware that these animals have been beaten into practically being killed to do these stupid tricks. If you ever ask anybody involved with the circus if you could go watch a training session with the elephants and big cats, they will never let you in. We have gotten information in the past from people who have hidden a camera, honest to god you just wanna cry and you have this insane desire to stop this insanity. It’s just deplorable. The great thing about social media is that people are waking up and are shunning special interest groups. Have you read my letter to Congress? The one about Kenneth Feld? The power Kenneth Feld has is absolutely phenomenal – talk about special interest groups, he owns our government. Will anyone stand with me against Kenneth Feld? He has been brought up on animal cruelty and animal abuse charges many, many times – at least five times that I know of – he pays a $200,000 or $300,000 fine and off he goes and continues this. So he’s basically a cash cow for them? This is my goal in life, to stop the insanity. I would like to see us be the generation that stops animal cruelty forever, and I hope that in my lifetime I will see that. Look to the Stars greatly thanks Ms. Hedren for her time and efforts at bettering this world, and we hope to have a small part in stopping the cruelty. To support Ms. Hedren, please visit the Shambala website.